I imagine this is how the board-room meeting went: “Gee Benjamin Franklin, you’re looking a little too regular! We need you to be more hip and happenin’! 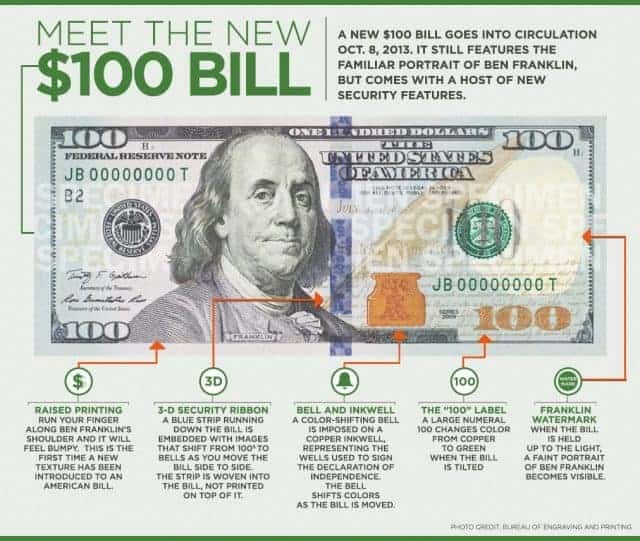 We have the technology, WE MUST REBUILD HIM.” After many painstaking hours of manicures, hairdos, and the infamous ‘sunglasses or no sunglasses’ debate, they hath made Benjamin Franklin anew on the $100 bill. All jokes aside, there is in fact a new $100 bill in the United States. Even more uncrackable than the last, this new bill has tons of new watermarks and individual characteristics that ward against counterfeiting. You can actually FEEL Ben Franklin’s shoulder now! Apparently he’s bumpy. I guess you could say that all of those lightning strikes ruffled his coat a bit! Not only that but, Ben’s got a fancy inkwell that changes color so that he may magically sign important documents post mortem! Dang BEN. Also he’s following the trend of 3D with crazy inlaid security ribbons that change from a big number to images of bells for some reason! WOW! Man everything on this bill switches from one thing to another by tilting the bill. I’m going to go ahead and say that this may be the first psychedelic Federal Reserve Bill. Just sayin. Stuff is whack on this money. Thus secure.